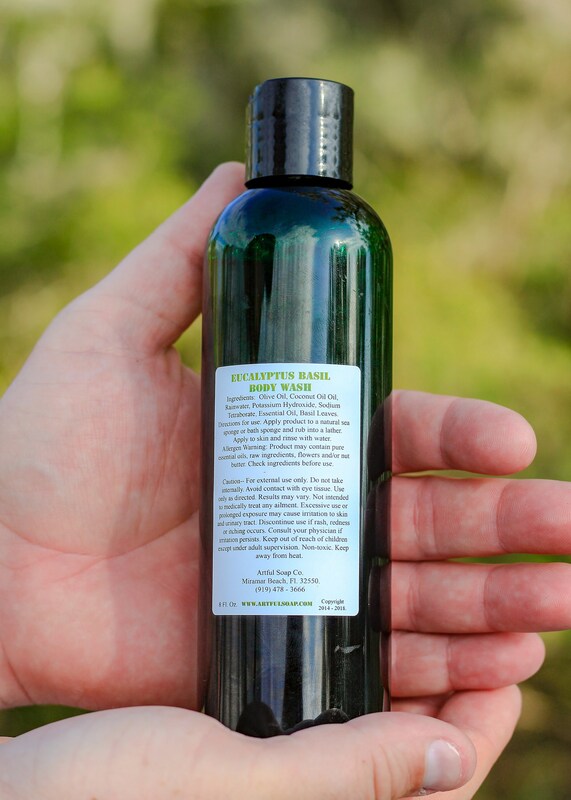 Eucalyptus & Basil Body Wash, Eucalyptus, Basil, Natural Soap, Liquid Soap, 100% Natural, Natural Body Wash, Natural, Pure. 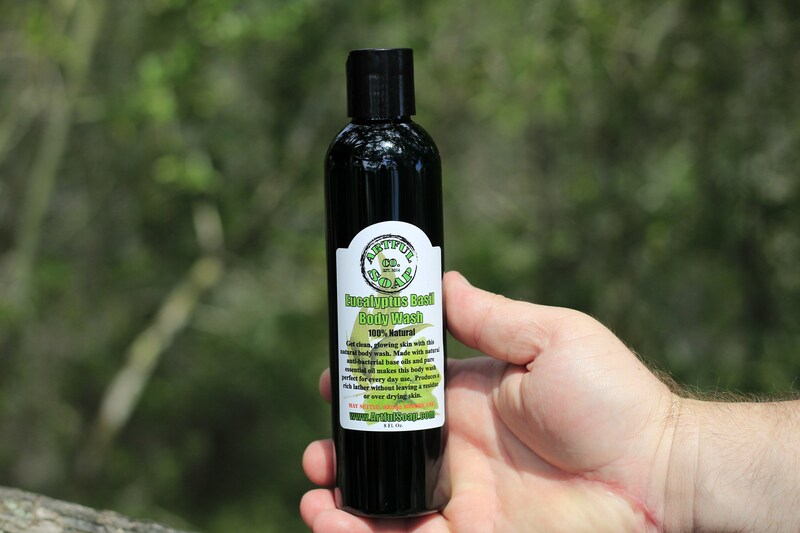 Get clean, glowing skin with this natural body wash. Made with natural anti-bacterial base oils and pure essential oil makes this body wash perfect for every day use. Produces a rich lather without leaving a residue or over drying skin. Some aromatherapy soaps have harsh chemicals and binders used to hold in the scent. Our soaps have no artificial chemicals and contains natural oils to nourish skin so scent strength may vary from commercial products. The health benefits of eucalyptus oil are well-known and wide ranging including anti-inflammatory, antispasmodic, decongestant, deodorant, antiseptic, antibacterial, stimulating, and other medicinal qualities. Eucalyptus oil is used for healing wounds, ulcers, burns, cuts, abrasions and sores. It is also an effective for insect bites and stings. Respiratory problems: Eucalyptus essential oil is effective for treating a number of respiratory problems including cold, cough, runny nose, sore throat, asthma, nasal congestion, bronchitis and sinusitis. Eucalyptus oil is antibacterial, anti-fungal, antimicrobial, antiviral, anti-inflammatory and decongestant in nature. A study published in 2004 shows its usefulness in treating non-bacterial sinusitis. Patients suffering from non-bacterial sinusitis showed faster improvement when exposed to eucalyptus oil. Mental exhaustion: One very important reason that many people use eucalyptus oil is that it creates a cooling and refreshing effect. Normally, people suffering from certain conditions and disorders are slightly sluggish. Eucalyptus oil, a stimulant, removes exhaustion and mental sluggishness and rejuvenates the spirit. It can also be effective in the treatment of stress. Muscle pain: If you are experiencing joint and muscle pain, eucalyptus oil on the skin helps to relieve stress and pain. The eucalyptus oil is analgesic and anti-inflammatory in nature. Note: Artful Soap Co. is not a laboratory or medical facility and makes no guarantees to the treatment of ailments. This product is not intended to medically treat any ailment. Consult a physician if irritation persists. Results may vary and information used is based on consumer feedback and public knowledge. Promotional coupons to your email address. Is it REALLY 100% natural? Yes, it is. We are very careful to ensure our suppliers of essential oil are certified organic manufacturers. We only purchase our base oils and other ingredients from certified organic or all natural companies. Great care is taken to keep all preparation tools cleaned with only natural products (ours to be specific) so as to prevent contamination of the product with outside chemicals. We even catch rainwater every storm instead of using purified water. We do all this so that we can assure you....it really is 100% natural! What is the bar soap weight. We cut it at 5.5 ounces. It usually weighs 5 oz. after curing which is the weight you should get in the mail. Remember, this is truly handmade so very slight variations may occur in weight. The Soap has a very long shelf life because we don't use any dairy in our blends (excluding our goat-milk products). Melt rate when bathing depends on how much the bar is exposed to water, but on average it should last about 2 weeks (daily use) if you keep it dry between uses. Yes. To select businesses. If you are interested, send us a message! Do you have a retail store? Yes. You can find our store in Miramar Beach, FL. at the Village of Baytowne Wharf. Yes. Unlike many natural soaps and milk soaps, ALL of our soap products, bar or liquid, lather extremely well. You'll get that same lather you're used to seeing in a soap. Plus, ours is natural! © 2019 Artful Soap Co.